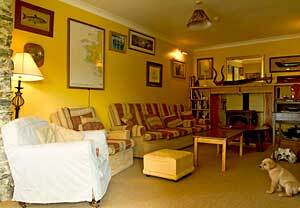 Sharamore House, Clifden, Co Galway is an Irish Tourist Board Approved Bed and Breakfast owned and run by John and Sue Brittain. Located just 3 minutes from Clifden, the capital of Connemara, Sharamore House enjoys a quiet location overlooking Streamstown Bay at the end of the famously scenic Sky Road. Bed and Breakfast Accommodation is provided in charming, comfortable guest bed rooms which are located on the first floor with each providing lovely views of the Connemara land and sea scapes. Each guest room has its own private bathroom and a combination of single and double beds to accommodate families or single guests. 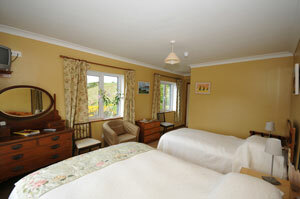 All our bed rooms have TV’s and light refreshments are available to guests at all times. Wireless internet access is available free of charge throughout the house. Some of the best beaches in Ireland are situated just minutes away from Sharamore for a lovely relaxing walk. If you prefer you can go walking in the Connemara National Park or take some of the more challenging routes through the 12 Bens. Westport and Galway City are just 1 hours drive through some of the most beautiful scenery in Connemara and can make a great day out if its not beach weather! If coming from Clifden, take the N59 to Westport. After 3 km, take the first left turning signed for Claddaduff. Sharamore is the two storey yellow house just 50 metres along this road on the right hand side. It is less than 5 mins driving time from Clifden town. If approaching from the Leenane direction, take a right turn, signed Claddaduff, as above. Allow plenty of time for the journey, if the West of Ireland is unfamiliar to you.